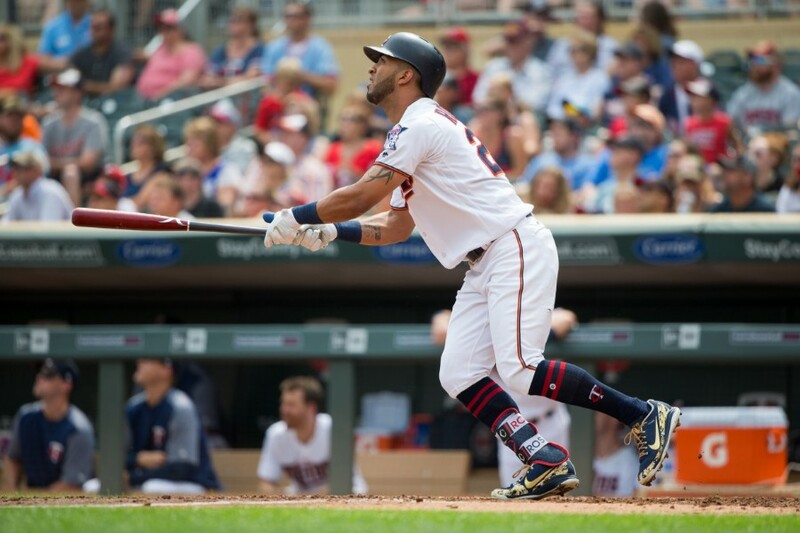 Facing Eddie Rosario has to drive pitchers crazy. No location is safe. No count is safe. Rosario hit a go-ahead home run in the bottom of the eighth on an 0-2 pitch that was out of the strike zone. It was up and in, Rosie sent it high and deep. The Twins entered this game with just an 11-19 record in one-run games, but Trevor Hildenberger (just barely) managed to make that lead hold up. I’m sure Super Rosario has some kind of a kryptonite, but it’s starting to seem the best hope opposing pitchers have is that he becomes too aggressive and gets himself out. Twins starter Jake Odorizzi exited this game with the Twins leading 4-1, but also created a mess. He left the bases loaded with Tigers and no outs in the sixth inning. Matt Magill took over a threw his first seven pitches out of the zone. He walked in a run, another runs scored on a double play and a third run came across on a single. Odorizzi’s line looks much worse than he actually pitched this afternoon, thanks to Magill allowing all those inherited runners to score. Still, this was the 15th time in 26 starts this season where Odorizzi failed to record an out in the sixth inning. As it is, Magill will get credit for two scoreless innings of work. Taylor Rogers recorded the first two outs of the eighth inning before giving way to Hildenberger, who recorded the final four outs to earn the victory. Detroit managed to get two runners in scoring position in the ninth, but Hildy struck out Niko Goodrum to end it. Jake Cave hit one of the most impressive home runs we’ve seen at Target Field all season. His 430-foot blast to dead center field landed in the “Catch” area above the batter’s eye. Max Kepler also homered in todays game. There was quite a bit of roster news to come out of Target Field the last 24 fours. Ervin Santana was placed back on the DL, Johnny Field was optioned back to Rochester. Alan Busenitz and Robbie Grossman are on their way back up. UPDATE: Tyler Duffey will be sent back down to Rochester to make room for Gonsalves. This may not make sense, but Odorizzi is great the first time through the lineup and not so good after.It seems like a great formula for a long relief pitcher. This may not make sense, but Odorizzi is great the first time through the lineup and not so good after. It seems like a great formula for a long relief pitcher. I like the idea of him being a FB/Slider reliever for 1 inning. I'm not interested in keeping him for the rotation since he tops out at 5 innings more often than not. Odorizzi should really return to the Rays and take the "opener" gig. He could consistently give you 3-4 solid innings of work. I'm looking forward to Gonsalves' debut tomorrow, here's hoping he'll pitch better than most Twins rookie starters do. I think it's time to end the Duffey experiment. I'd rather see Jake Reed or Nick Anderson get some mop-up innings. For the first time in a while I don't have many complaints about the bullpen, they finally got Moya, Busenitz, and May up to the majors. Where would the Twins be without Rosario this year? I shudder to think. What a fantastic player and this team is very lucky to have what looks like one of baseball's premier outfielders. Side note: I thought that Phil Miller tweet said "Brian Dozier contributed all 6 HR himself" and I was really confused for a minute. Now I get it. For the first time in a while I don't have many complaints about the bullpen, they finally got Moya, Busenitz, and May up to the majors. We could complain about Hildy, and Magill allowing all 3 inherited runners to score today...but what's the fun in that? The Twins won, the 'pen has indeed pitched pretty well this series. The guys you mentioned are performing well indeed. Fun seeing the Twins make a bit of a run. Looking forward to the big debut tomorrow for Gonsalves! Not only does the bullpen roster look better but the usage isn't cringe inducing lately! If there was real change in how Molly spread out the workload I wouldn't have many complaints with him. Now hildy needs a couple of days off. Maybe he could use Tom's chart! It's a bummer Odorizzi doesn't go more than five innings all that often, but on the plus side he's a solid bet to go five. He's done that in 19 of his 26 starts, just about the same as Berrios (18 of 25). Also, Odorizzi has pitched to Garver way more often than the other two guys who have been in the rotation all year. I love Mitch, and the only way he's going to get better is by playing, but I see that breakdown and I feel like Odorizzi deserves some extra credit. I don't think there's any question that Wilson and (before he went down) Castro are miles ahead of Garver in terms of game calling. It's not like Odo was ever Mr. Efficiency, but he did average 5.67 innings per start over the four years prior to joining the Twins, and that's down to 5.03 this year. I feel very comfortable penciling Jake into the rotation next season. This was a tough one, with 2 woeful teams trying to give the game to each other. It was a race between the Twins' woeful pitching vs. the Tigers' woeful hitting, and fortunately the Twinks were not as good at being bad today. Woke up at 4:30 (that's a.m.) and watched me some Quick Pitch, and what did my groggy eyes see but Rosario getting big hits for the Mets. 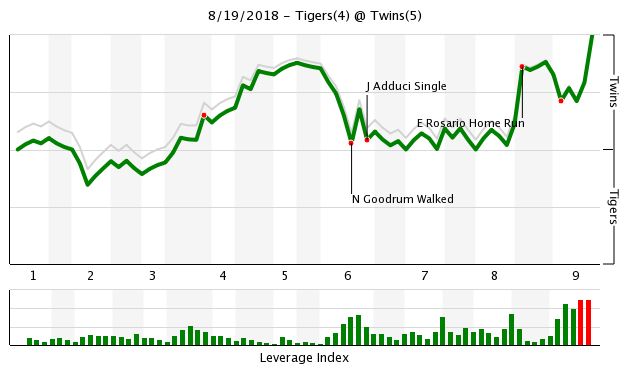 Did we trade Eddie right after his go-ahead HR? Confusion was cleared up with a quick check of rosters. Whew. That was close. I also make trades in my sleep. I once, traded my pillow for a jar of peanut butter. That was smooth. Brian on the other hand is chunky. How'bt we let Garver catch for Berriosall the game and Gibson all the Games and we'll let Wilson catch for Odorizzi all of his games.I'm betting not much would change. I don't believe that Odorizzi's control issues have anything to do with pitch calling. He often misses way off the target and way out of the zone. Is there some objective evidence that Wilson is way better at calling games than Garver? Not any ones in which I'm satisfied with the methodology, but there are some pretty good pitch framing metrics, and those suggest Garver is one of the worst in the league while Bobby is above average. That could certainly make a massive difference for a guy who needs all the strike calls he can get. Or it could make little or no difference because he is missing by so much it makes no difference. What do you truly believe is the difference between how many extra strikes Odorizzi might have gotten by having more pitches caught by Wilson? I think that it is as negligible as the subjective pitch calling that was your original criticism of Garver. Maybe, maybe not. It depends on the situation. You miss a strike when you're up 0-2 with the bases empty and two outs, no big deal. You miss a strike when you really need it, that could lead to a big inning. I also think, as a flyball pitcher, Odorizzi could have benefited from the expected outfield alignment of Rosario-Buxton-Kepler. Hopefully those guys will be behind him for the majority of next season. I was actually pointing out that Odorizzi makes a lot of non-competitive pitches that cannot be framed as a strike.But I appreciate and am a bit surprised by the zone %. Overall, the statistics are very close between Garver and Wilson catching, even though Garver doesn't get the benefit of catching Berrios and Gibson as much, while he's caught the vast majority of Lynn's and Odorizzi's games. ERA is 4.42 with Garver and 4.16 with Wilson. OPS is .756 pitching to Garver and .735 pitching to Wilson. I suspect those numbers would be fairly well flipped if Garver caught Berrios and Gibson more and Wilson had caught Lynn and Odorizzi more. Garver's numbers are also artificially jacked up by catching all of Santana's starts this year -- 8.03 ERA and 1.038 OPS in 5 games. And while the splits for the individual pitchers are a small sample size, only Berrios and Odorizzi (who has only been caught twice by Wilson) do better with Wilson behind the plate. Gibson has done far better in his 7 starts with Garver than in his 16 with Wilson. So I think it's not clear that having Wilson catch is better for the pitchers than having Garver catch, and there's a good argument for the opposite.